Bertie and Nicola, our hosts in County Clare for the Galway & Clare Riding Adventures, took us to the Cliffs of Moher, a spectacular natural wonder on Ireland’s coast. If you ride on the progressive or post to post Galway Clare Riding Adventure, you can take on a six day ride to the coast, ending at a spot with a view of the Cliffs of Moher. With post to post or progressive rides, you travel somewhere new every day and trail ride to a destinations. On our visit to the cliffs, the winds were gusting hard, as they are a lot in this coastal area, and I could imagine being just down from the cliffs on horseback with the wind in my face. Having done a ride right along a cliff that dropped off to a glacier fed river in Iceland, I know that this can be exhilarating, exciting, and a bit scary, as long as you don’t get too close to the edge. I had visited the Cliffs of Moher a few years ago, but not since they built their new museum. After almost getting blown off the cliffs and into the wild Atlantic Sea, we went inside the visitors center and museum. The exhibit inside takes you through the geological history of the area. There’s a zen-like 3-D exhibit with animation that takes you on a close up tour of the cliffs and what’s under the sea below, so you feel like a bird, diving down from on high and into the waters. We drove through the quaint village of Corofin on the edge of the Burren. On the Galway Clare Trail Ride, you stay in Corofin for a night. Passing over a little stone bridge, we passed the colorful pubs of this small Irish village. Not a lot of tourists trek here. When riders on vacation go to the pub here, it draws a crowd, making it even more interesting for holiday travelers, as they can mingle with the locals. 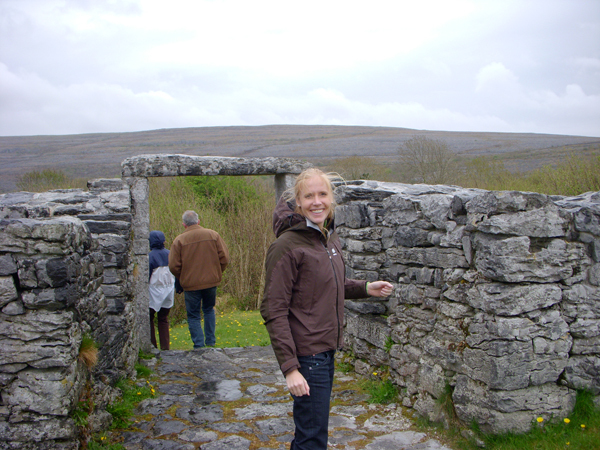 We traveled on through the Burren, an archaeologically rich area of Northwest Ireland. There are rocky limestone moonscapes everywhere. 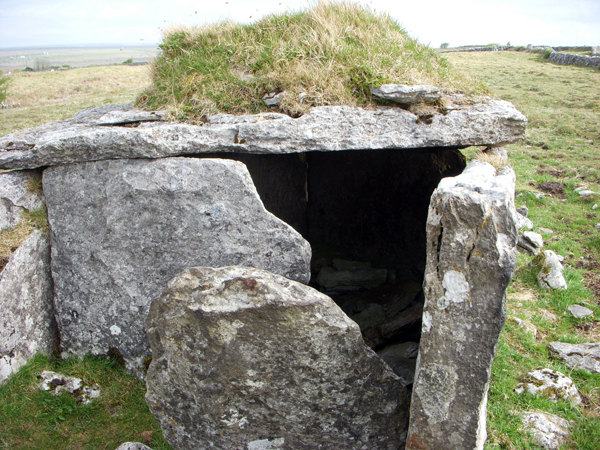 We saw several portal tombs and visited a historic ring fort, all stops best reached on horseback. 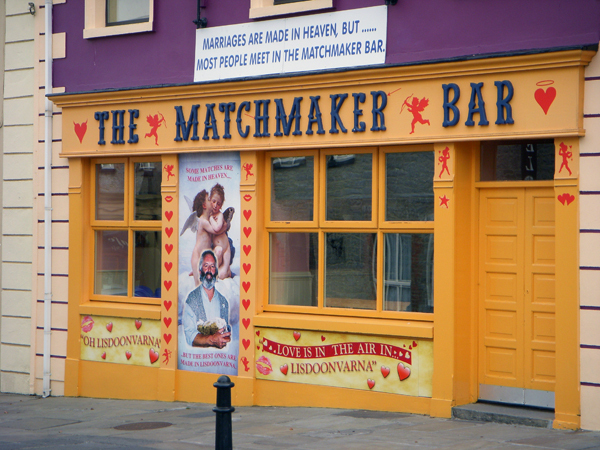 We also visited the town of Lisdoonvarna, where in September there’s the annual Matchmaking Festival. Stay tuned for special riding vacations where you can attend this wild local festival. Originally, it began with farmers looking to get matched up, and has become a month-long international party. 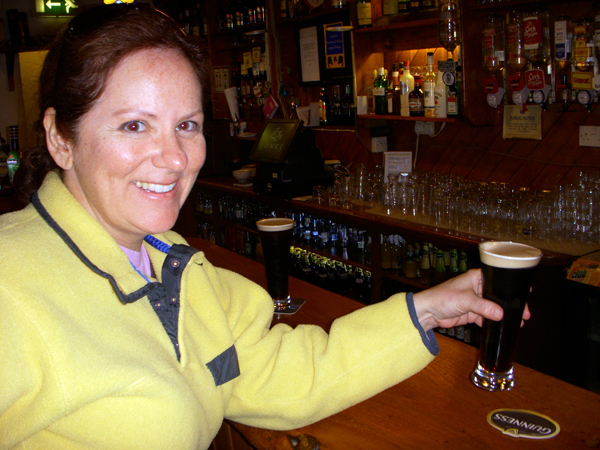 We had lunch at a local pub by the sea where Julie had her first Guinness and I warmed myself with a cup of hot tea. I’ll be trying the Guinness later on for sure. Learn more about the Galway & Clare equestrian vacation in Ireland at EquitrekkingTravel.com and travel in Ireland at DiscoverIreland.com.